V1736. 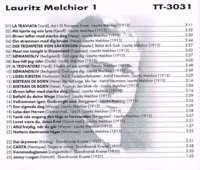 LAURITZ MELCHIOR (as Baritone): Songs by Helmuth, Lange-Müller, Körling, Kjerulf, Mortensen, Weyse, Berggreen, Hassler, Heise, Friedman, Henriques, etc. ; Arias from La Traviata, Il Trovatore, Der Trompeter von Säkkingen, Sømandslivliden Kirsten & Bertran de Born; Scandanavian Quartet (Melchior, Peelmann, Madsen & Hansen): 4 songs. (Germany) Truesound Transfers 3031, recorded 1913-20. Transfers by Christian Zwarg, obviously from immaculate 78rpm copies! Although in the 1920s Melchior was planning to make Germany the center of his career, the unforeseen Nazification and Great Depression of the early 1930s in fact moved him away from that country's theaters, including ‘Hitler's Bayreuth’. After 1933, the majority of his opera season was spent at the Metropolitan. It was a Dionysiac time for Wagner performance. His only new operatic rôle in the 1930s was Florestan.